When choosing bathroom wallpaper to decorate your walls, you'll find lots of designs, patterns and colours to complement any bathroom setting be it traditional or modern style. If you're struggling to decide between bathroom tiles and wallpaper, why not consider tile-styled bathroom wallpaper which has the look of bathroom tiles on the wall but is simply wallpaper. Create a luxury bathroom setting with designer bathroom wallpaper from a range of prestigious names. Choose from a handpicked selection of designer wallpaper for your bathroom, en-suite or cloakroom in a range of modern and traditional styles. 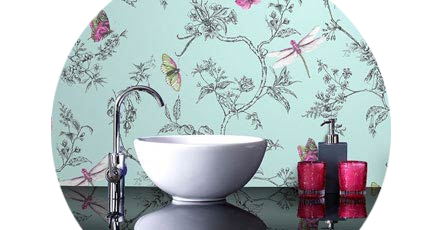 If you're buying bathroom wallpaper on a budget, but would like a designer look then why not wallpaper a feature wall? Wallpaper for bathroom walls is able to withstand the normal humidity found within bathrooms and shower rooms. A large percentage of bathroom wallpaper designs are wipeable which means you can remove marks, dirt and things like toothpaste, which often end up on the walls, keeping your wallpaper looking great.